Dr. Matthew Hanson is double board certified as a Dermatologist and Dermatopathologist. He specializes in the diagnosis and treatment of skin diseases in patients of all ages. 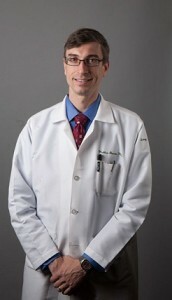 Dr. Hanson completed his undergraduate degree at The University of North Carolina at Chapel Hill, where he graduated with honors. He continued his education at Drexel University College of Medicine in Philadelphia, receiving his medical doctorate in 2005. After finishing an internship in Internal Medicine at Hahnemann Hospital, he remained for his dermatology residency, where he had the honor of being appointed Chief Resident. After concluding his residency, Dr. Hanson stayed to further his medical education as a fellow in Dermatopathology. Throughout his residency and fellowship, he cultivated an interest in Genodermatoses – skin diseases with a genetic predisposition. At Premier Dermatology and Cosmetic Surgery, he continues these efforts, bridging the clinical and laboratory sciences to bring the most comprehensive treatment options to patients. In addition to his clinical efforts, he enjoys teaching through Christiana Health Care Systems and encourages dermatologic interests for those in residency. In his free time, he enjoys fishing, camping, and spending time with his family.